Neophilaenus species can be separated from Philaenus by the straight costal margin in the basal two-thirds of the forewing; there are several UK species. With a length of 5-7mm, Neophilaenus lineatus can be identified by the pale line running down the outside edge of the forewing, and by the central, anterior 'plate' on the vertex which is wider than long (the latter feature separating it from the similar, but rare Neophilaenus longiceps, which is restricted to salt-marshes). 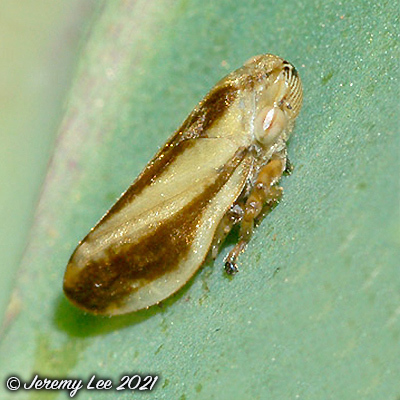 The apex of the scutellum is normally dark, and the face has dark transverse lines, and a dark midline. There is a dark form that occurs in certain populations living on purple moor grass Molinia caerulea. A very common grassland species across the UK. Adults are active June to November, sometimes overwintering.